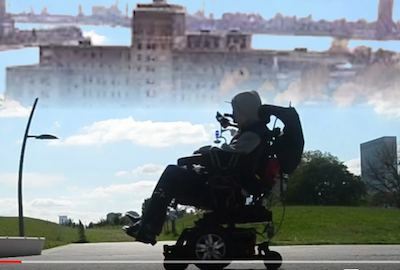 Video by OPEN DOORS member Andres "Jay" Molina, chronicling fellow OPEN DOORS member LeVar "Var" Lawrence's memories of Goldwater Hospital on Roosevelt Island. Take a look at November 2013 final day of Goldwater Hospital and July 2013 video of patients expressing their fears and concerns of Goldwater being shut down. 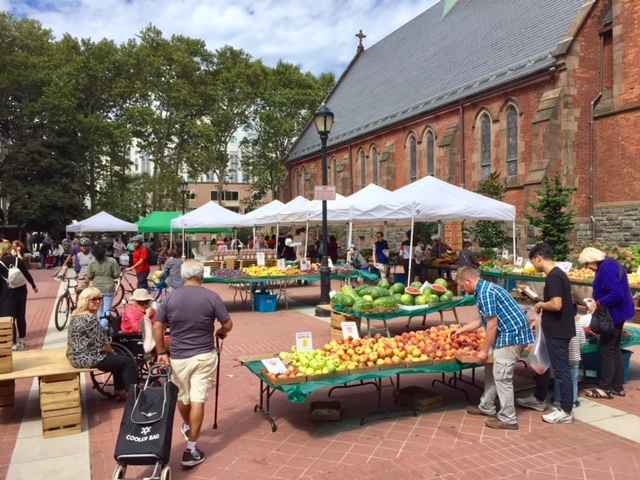 The Roosevelt Island Farmers Market made a very successful move to Good Shepherd Plaza last Spring. But, be advised that the Roosevelt Island Farmers Market is moving temporarily back to it's former location under the Motorgate Plaza Helix for the cold winter months starting Saturday November 24.
and will return to the Good Shepherd Plaza March 9. The weekly Roosevelt Island Farmer’s Market, administered by the Parent Teacher Association of PS/IS 217, is going back home this winter. 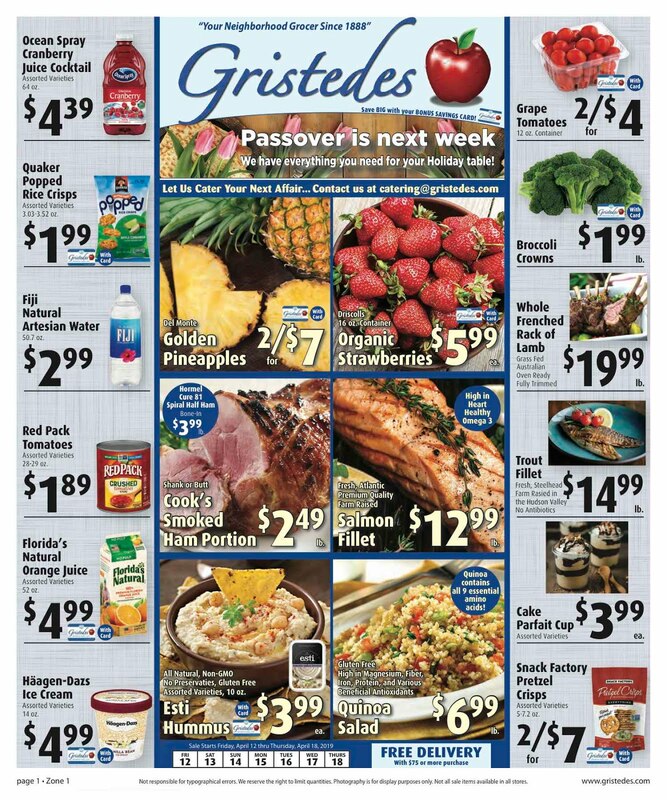 The Saturday market - which offers fresh fruits, vegetables, dairy, meats, baked goods and other specialty products - is moving back to its former location under the Helix road ramp from its current location at Good Shepherd Plaza beginning November 24 through Saturday March 9, 2019. The enclosed space under the Helix can be heated and is expected to keep both vendors and customers comfortable while selling and buying goods. Not sure what RIOC means by administered by the PTA. My understanding is that the PTA does not do anything for the Market other than collect fees from vendors. Good news for this weekend. to and from Manhattan this weekend. That's two weekends in a row. There is Roosevelt Island ferry service on the Astoria Route. Here's the new Winter Schedule for Roosevelt Island ferry service. PLEASE BE ADVISED THAT DUE TO SEVERE WEATHER CONDITIONS VEHICLES ARE HAVING DIFFICULTY DRIVING UP AND DOWN THE ROOSEVELT ISLAND HELIX RAMP. THE NYC SANITATION DEPARTMENT IS ON SCENE ATTEMPTING TO PLOW AND LAY DOWN SALT TO CORRECT THE CONDITION AND ALLOW FOR SAFE PASSAGE BY MOTORISTS. AN UPDATE ADVISORY WILL BE SENT OUT ONCE TRAFFIC HAS RESUMED ITS NORMAL FLOW. PLEASE EXERCISE CAUTION WHILE DRIVING IN THESE CONDITIONS. 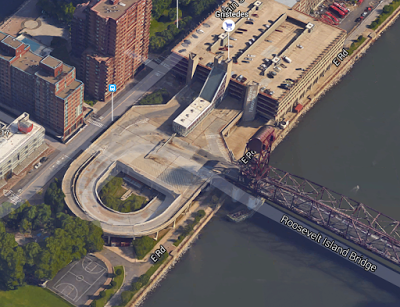 PLEASE BE ADVISED THAT AFTER A BRIEF WEATHER-INDUCED DELAY TRAFFIC ON THE ROOSEVELT ISLAND BRIDGE AND THE HELIX RAMP HAS RESUMED ITS NORMAL FLOW. THE NYC DEPARTMENT OF SANITATION AS WELL AS RIOC EMERGENCY VEHICLES WILL BE PLOWING/SALTING THROUGHOUT THE EVENING. PLEASE EXERCISE CAUTION WHILE DRIVING IN THESE CONDITIONS. Enjoy some great eats, beverages and indulge in a few sweet treats! Watch Serendipity 3's Joe Calderone make their famous Frozen Hot Chocolate. The weather is starting to get cold and winter is coming soon. Snow is expected tomorrow. The Public Safety Department is hosting its annual NY Cares Coat Drive. 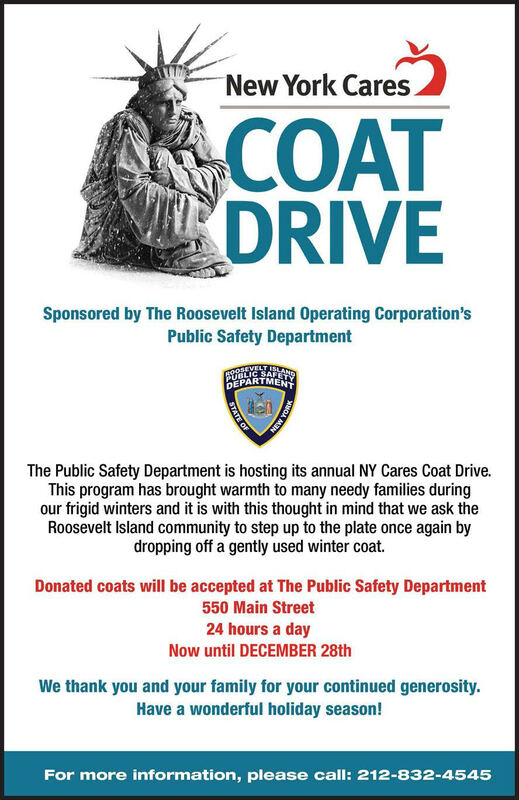 This program has brought warmth to many needy families during our frigid winters and it is with this thought in mind that we ask the Roosevelt Island Community to step up to the plate once again by dropping off a gently used winter coat. We thank you and your family for your continued generosity. New Yorkers eager to trade in their summer styles for some like- new fall fashions are in luck. 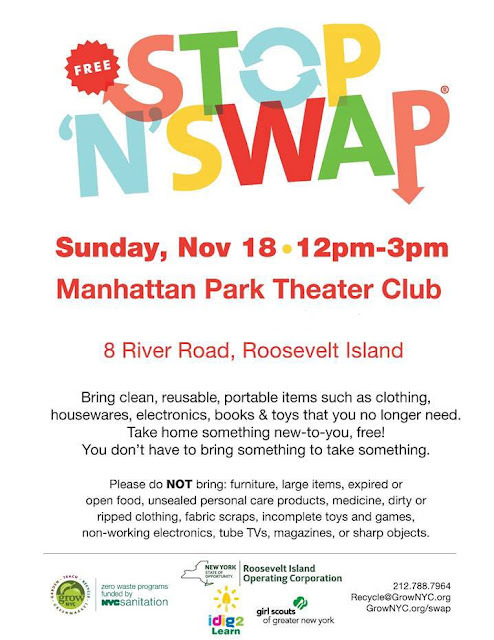 Stop ‘N’ Swap®, a free community reuse event organized by the local non- profit GrowNYC, is coming to Roosevelt Island for the very first time, in partnership with iDig2Learn and the Roosevelt Island Operating Corporation. The public is invited to bring clean, portable, reusable items to share with those who can use them. No one is required to bring something to take something — you can simply show up with a bag and see what’s free for the taking. “The average NYC household discards about 2,000 pounds of waste a year. By reusing through events like Stop ‘N’ Swap, NYC residents can take part in diverting over 40 million pounds of material a year from the landfill,” said Marcel Van Ooyen, GrowNYC President and CEO. The organization has set a goal of hosting one swap in each of the city’s 59 community districts each year in response to increasing demand for the events. 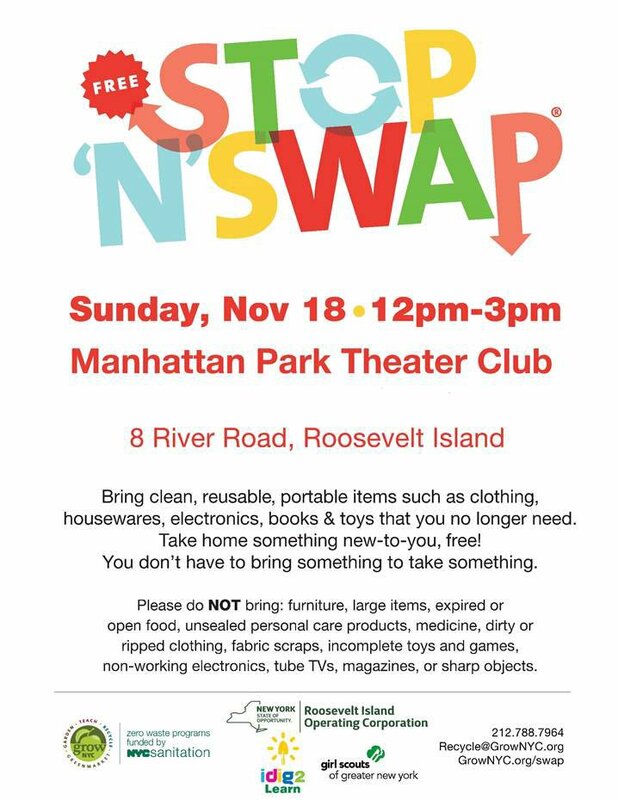 Girl Scout Troop 3233 will also be at the Roosevelt Island Swap, helping share ideas with New Yorkers about reuse and its value. “I’m proud to see these Girl Scouts taking action to make the world a better place by working to use resources wisely, and reuse items rather than buy new ones,” said Meridith Maskara, CEO of the Girl Scouts of Greater New York. Amazon announced today that Anable Basin in Long Island City, right across the East River from Roosevelt Island, will be the site of one of it's two new Headquarter sites. ... The City-State agreement with Amazon includes commitments to build a jointly-funded 10,000 square-foot onsite employment center to connect local residents with jobs and training. A $15 million investment will expand the JobsPlus program to Queensbridge Houses and expand tuition-free tech training to its residents—serving nearly 1,800 residents over the next 10 years. The Memo of Understanding between NYC, NYS and Amazon here. The Anable Basin Long Island City Amazon HQ is a less than 5 minute ferry ride from Roosevelt Island. ... “Amazon’s decision to locate to Long Island City is an affirmation not only of N.Y.C.’s growing tech talent,” Mr. Bloomberg wrote on Twitter, “but also of all the investments — in housing, schools, parks, transportation, and culture” made in Long Island City. Cornell Tech Dean Dan Huttenlocher is also an Amazon Board Director. Has anybody talked about how Roosevelt Island is now already almost all expensive coops with the Cornell campus right there and a tram ride from Bloomingdales and is maybe obviously going to be taken over by Amazons? and NYC Council Speaker Corey Johnson has reservations as well. ... 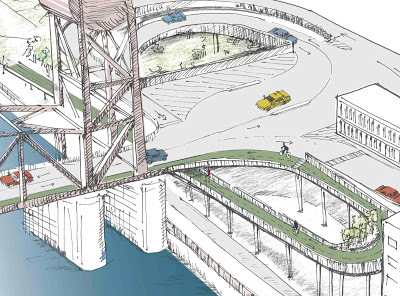 Informed by our decades working with local residents, businesses and institutions, we have developed a vision for Anable Basin centered around that spirit of productivity and quality of life – one that maintains light manufacturing while also creating public accessibility to a long-shuttered waterfront. We are proud to have a partner in Amazon that shares that vision. We’ve seen firsthand in Seattle how the company has worked to develop and integrate its campus and employees into the surrounding community, and we know Amazon intends to execute a similar vision here. It’s therefore meaningful for us, as a family, to be able to work closely with Amazon on a plan for Anable Basin that honors the character of LIC and stays true to the same vision of innovation and productivity that drew our grandfather, Louis Pfohl, here seven decades ago, and was furthered by his children, Ann, Jim and Lynn. Plaxall welcomes Amazon to LIC and looks forward to continuing our longstanding discussions with the community about Anable Basin as plans move forward. CBS News has more on Who Benefits from Amazon LIC HQ. Amazon explains it's HQ decision. And press conference on Amazon LIC HQ by Governor Cuomo, Mayor de Blasio and staff. UPDATE 11/15 - Here's the November 14 Protest Rally against proposed Amazon Long Island City HQ. UPDATE 1/29/19 - More info on Amazon jobs at LIC HQ. Our Roosevelt Island facility is located at 520 Main Street. Our Office hours are Monday to Thursday 9AM - 5PM, Friday 9 AM - 4 PM, Saturday and Sunday 10AM- 3 PM. Phone # 646-977-7974. RIRA Recommends $150,000 RIOC Public Purpose Funds For Roosevelt Island Non Profit Organizations - Was Carter Burden Senior Center Slighted With Much Smaller Amount Than Others? 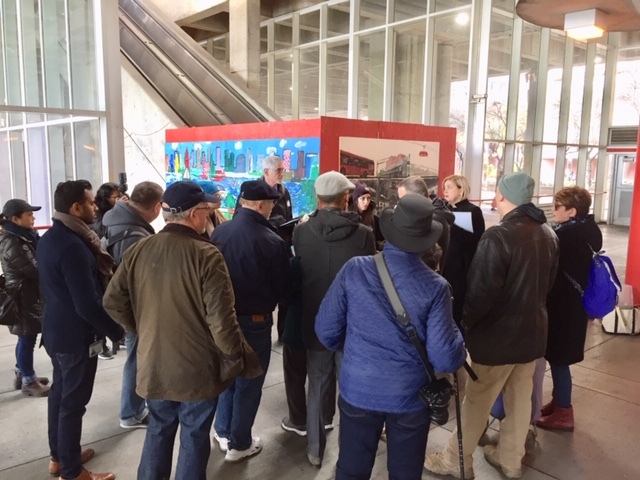 The final meeting of the Roosevelt Island Residents Association 2016 -18 Common Council approved the recommendations of it's Public Purpose Funds (PPF) committee for distribution of Roosevelt Island Operating Corp (RIOC) 2018 Public Purpose Funds in the amount of $150,000 for 10 Roosevelt Island non profit organziations. PPF Committee Chair Dave Evans reported to the November 7 final meeting of the 2016-18 RIRA Common Council meeting. The RIRA Common Council’s four member PPF Committee reviewed the RIOC-provided applications of ten Roosevelt Island 501c organizations. Each is seeking funds for their respective program(s). After reviewing the Committee report during its meeting on November 7, 2018, the RIRA Common Council approved it for transmittal to Ms Rosenthal and her appropriate staff. The Common Council is very pleased that RIOC increased the funding availed from $100,000 to a total of $150,000. Of course, the Common Council hopes to see further increases aimed at an eventual steady state of three percent of the RIOC operating budget per legislation approved by Governor Cuomo. Further to the above, it is with pleasure that we provide you the attached funding recommendations for your review and approval. If any questions, please let us know and also when this matter will be on the agenda for review and approval consideration of the Corporation’s Board. The Committee will provide under separate cover other forms that RIOC requires. We thank RIOC for its continued commitment to support the community. The PPF program is evidence of that. Additionally, we thank you for continuing to allow the RIRA-Common Council to provide inputs to the important process of availing funds to qualified Roosevelt Island applicants. and PPF monetary distribution recommendations for Roosevelt Island non-profit organizations. Committee Decision and Recommendation: The funds are only for the Salvadori Center program comprised of and representative of the School*s diverse population of 6th through 8th graders. Committee Decision and Recommendation: The funds are to be used to help cover the nature teacher*s salary. Committee Decision and Recommendation: To help the WFF in meeting its mission of rescuing, assisting, and rehabilitating stray animals on Roosevelt Island -- as the Director deems appropriate. Committee Decision and Recommendation: Funding is to support ensuring an operable heating and cooling (HVAC) system. To help better assure cost-effectiveness, there should be at least five years on the lease. Committee Decision and Recommendation: The funds will be used as the Director deems appropriate in support of salaries for kiosk workers, maps, Historian support, but not for Cornell. Committee Decision and Recommendation: The approved funding is primarily for the emerging young adults program and to help with scholarships for the most needy young kids. Committee Decision and Recommendation: The funds are to be used as deemed appropriate and/or proportionate to support meeting the objectives of scholarships, a summer musical theater camp, and some limited community outreach -- all with keen efforts to promote broad diversity -- encouraging diversity by helping minorities who are underrepresented in the programs offered. Committee Decision and Recommendation: The funds are aimed at helping to fund an instructor for a class of choice. Committee Decision and Recommendation: The funds are aimed at funding a manager and/or visiting contractors for uses relevant to the needs of the applicant. Committee Decision and Recommendation: The funds are intended for use in supporting trips and other activities as determined by the Director. It is strongly recommended that research and planning is undertaken for an upgraded transportation bus. Overall, the use of funding, given the aforementioned language in this section, is at the discretion of the Director. The RIRA recommendations ranged from $9,750 to $29,500 for 9 of the 10 Roosevelt Island non profit organizations. Left far behind was the Carter Burden Roosevelt Island Senior Center who received a recommendation for much less - $3,250. The final decision on distribution of Public Purpose Funds is made by RIOC. and that a threat with a gun was made by a student. There was a large Nypd presence at Ps/is 217 this morning. I’m told a student claimed to have a gun. Is that true? Was the school shut down? Do you have any statement on incident? In response to my inquiry, a NYPD spokesperson replied there was a dispute between a student and teacher but that no gun was involved. Possibly someone can clarify me a doubt. Could somebody explain to me why no one is doing anything (PSD, RIOC, PS/IS217, DOE, NYPD, etc.) or why are some parents more concerned about the Library Fair than the threat of gunfire at the Island’s school? ... Last night happened a new mass shooting (number 307 so far this year). Hopefully somebody can answer my questions. On Friday, November 9, I again asked PS/IS 217 Principal Beckman about the alleged gun incident at the school. The safety and well being of all students and staff members at PS/IS 217 remain our highest priority. Towards that end, we understand that there have been questions in the community regarding an alleged threat that took place two weeks ago. Though we are not at liberty to share information about particular students or specific follow-up related to any student, we assure you that every precaution was taken to ensure the safety of all students and staff. We look forward to your continued partnership as we work together to ensure PS/IS 217 continues to provide the best and safest learning environment possible for all of its students. 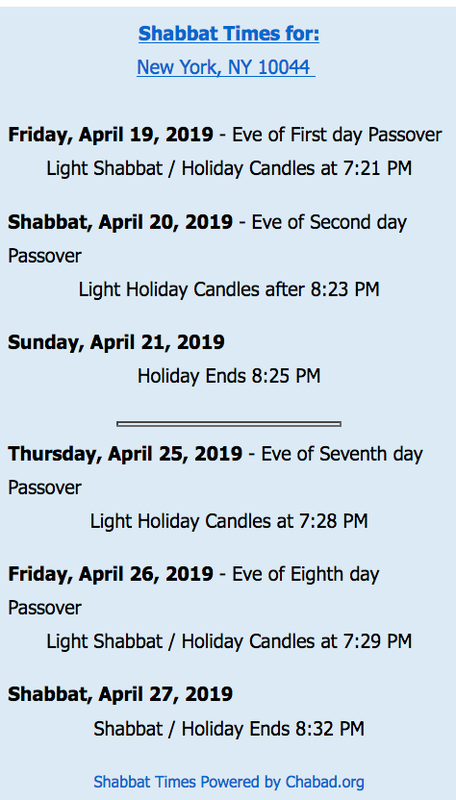 If you have any questions, please feel free to contact me at 212-980-0294. Chief Jack McManus ... called me back to give out the facts of what really happened at PS 217 a couple of weeks ago. Both PSD and NYPD got involved immediately and the parents of this child were contacted and spoken to. There is no legal requirement on what action the parents have to take and so there is no additional news on what follow up they have done personally with their child. It appears that the main issue with this incident is the lack of communication from PS 217 about the incident taking place and having to hear it from a random email. 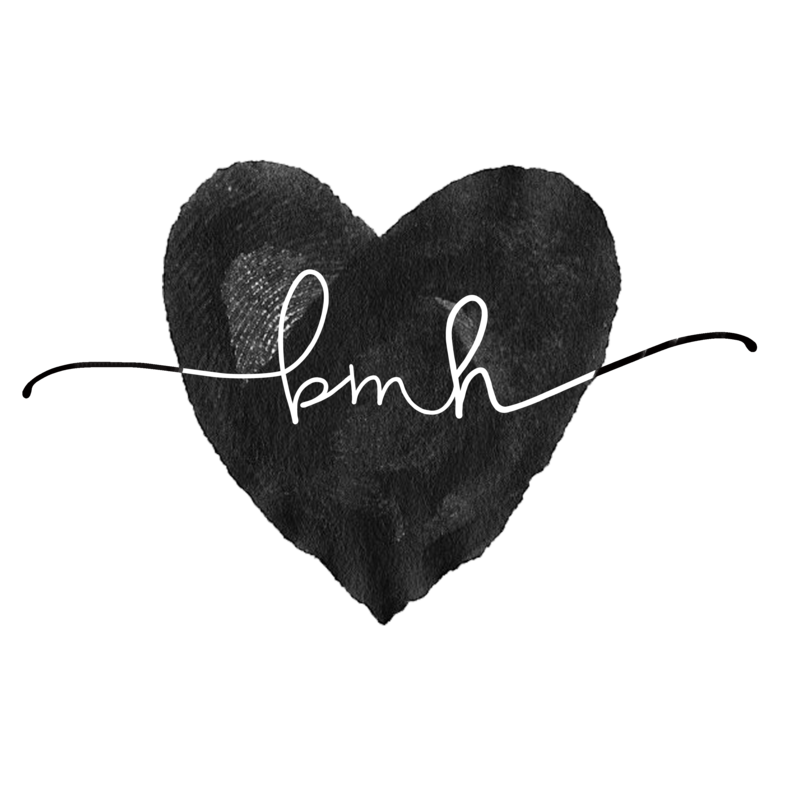 Although we should not scrutinize every single flippant thing kids say on the playground, in today's day and age with gun violence at school's being so common place this is a particularly sensitive topic that we cannot take lightly. Schools should be advising students on things that are unacceptable to do/say and advising parents on topics that they must talk to/re-iterate with their kids at home. At the same time we should keep a little bit of perspective - this is an 11 year old child who said something incredibly stupid in a fit of frustration. Even us as adults can admit to being guilty of saying things we don't really mean. As a community we should be concerned but equally empathetic to this childs emotional state as well as his/her parents state. Lastly, Chief McManus has also asked whether the parents would like to have a town hall to discuss some of these issues? If you prefer we could also work on holding a video conference call so that more parents can dial in and submit questions. Rumors spread when information is hidden from the public. 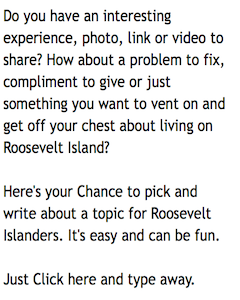 Best to communicate quickly and honestly with the Roosevelt Island community. The Roosevelt Island Holiday lights were being put up last week by the vendor Neave Group. Take a look at a few of the displays all lit up, the Reindeer Sled at Good Shepherd Plaza, Giant Ornament Balls at Tram Plaza Fountain, Colorful trees and Star at Riverwalk Commons and Holiday/Christmas Tree at Riverwalk Lawn. 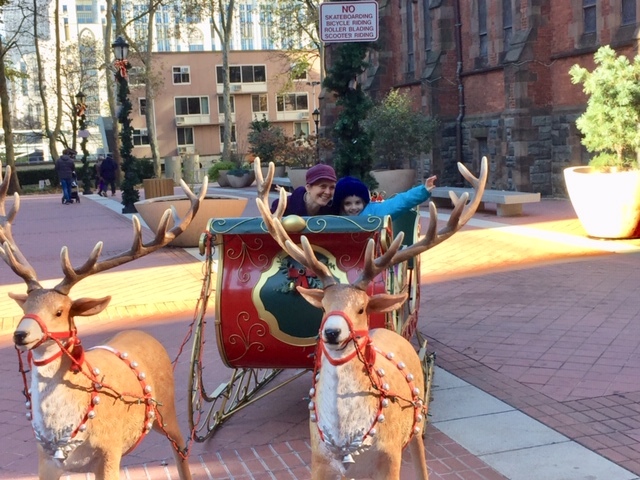 The Roosevelt Island Reindeer Sled is becoming a very popular attraction for picture taking. Lines have formed to take pictures in the Reindeer Sled. It's going to look even better when the snow comes. The winter holidays at Roosevelt Island are special. Decorations are up, and the Island is looking festive. The season offers us time for reflection and perspective. It lets the light of our good deeds shine. We look forward to warm reunions with old family and new friends. The true spirit of the season can best be seen in our children’s faces who reflect the wonder and excitement of anticipation. A special guest is coming to Roosevelt Island again this year and what’s he going to bring? 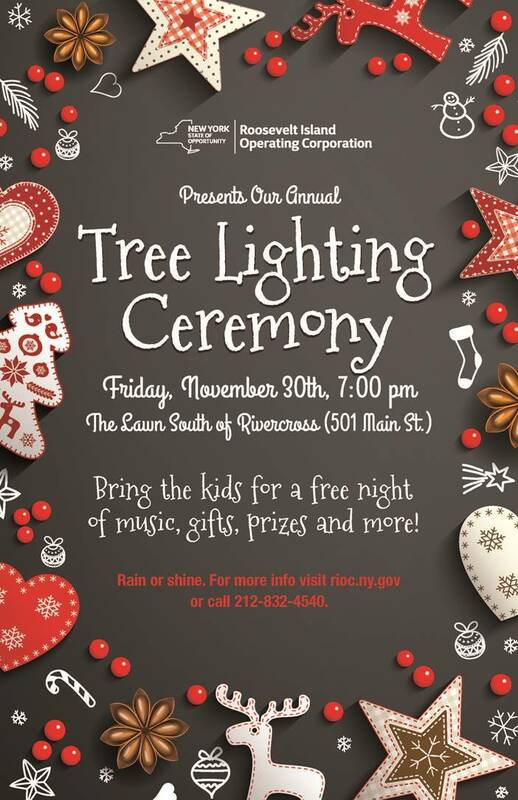 The Island’s Annual Tree Lighting Ceremony is set for Friday, November 30 at 7 p.m. at the lawn south of Rivercross. Island residents are invited to join us for a night of holiday music and caroling - featuring a variety of community organizations - a live band, hot beverages, warm cookies, raffle prizes and goodie bags. Each year, are spirits our heartened and delighted by the generous contributions our local businesses and organizations make toward this event. Can we count on you again this year? Please see the attached form to learn how you can contribute. The deadline to participate is Wednesday, November 21. ... Examples: coffee, hot chocolate, cider, cookies, restaurant or other voucher certificates and cards, gift baskets, or other suggested items to be used in event raffle. Today, November 11 is Veterans Day. organized by the Roosevelt Island Operating Corp (RIOC) and attended by a standing room only crowd of residents of all ages. The Roosevelt Island Veterans Day celebration speakers included RIOC President Susan Rosenthal, Congresswoman Carolyn Maloney, Joel Evans, deputy commissioner of the NYS Division of Veterans Affairs; Lyn Johnson, USMC Veteran, MSW and Veterans Administration Outreach Specialist and RIOC) Board member and veteran David Kraut. There were performances from the NYPD Honor Guard, the Main Street Theater and Dance Alliance and the Roosevelt Island Girl Scouts as well as food and refreshments catered by Nisi Restaurant. and audience members recited names of Veterans they remember today. to establish a Veterans Center on Roosevelt Island. 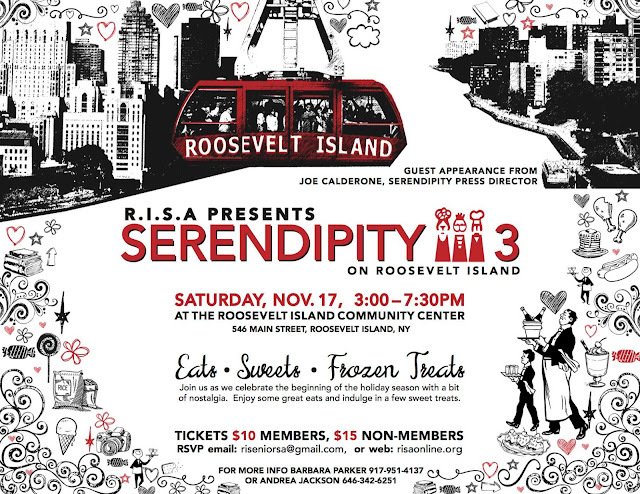 Mr Sciallo passed away in 2015, but his suggestion of a Roosevelt Island Veterans Center may come to pass. 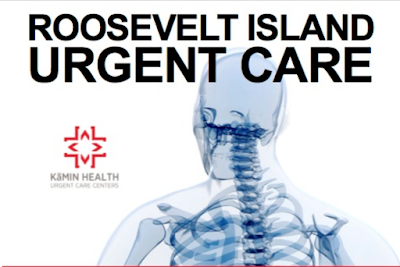 RIOC is actively exploring ways to establish a Roosevelt Island Veterans Center. 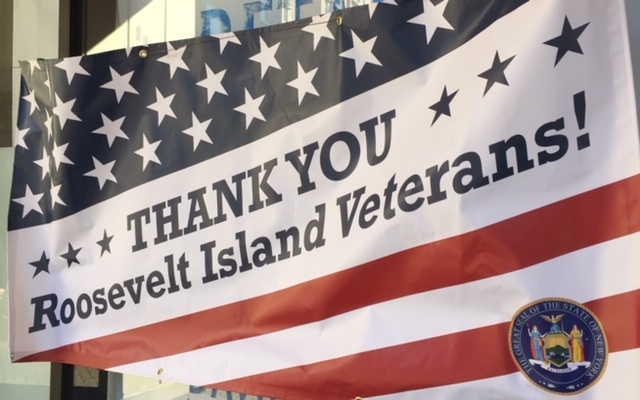 The Twitterverse reports on the Roosevelt Island Veterans Day Celebration. 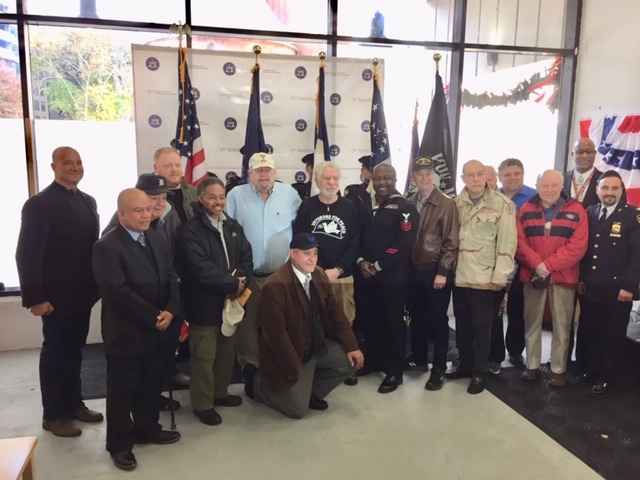 Kudos the RIOC for organizing Roosevelt Island Veterans Day Celebration.